ProPalette gives users control over secluding a particular color and making adjustments with in their scene with over 70 presets all with in Final Cut Pro X. 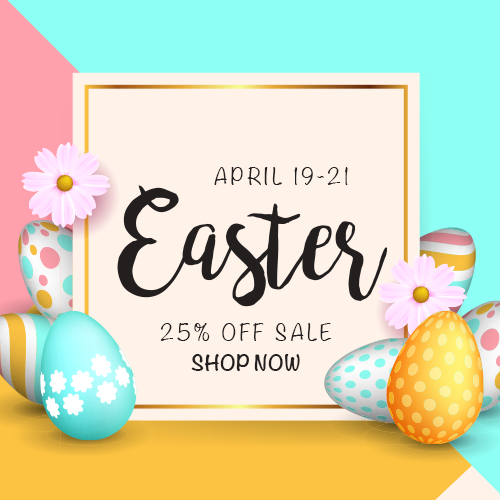 Users have the ability to alter the color’s softness, color matte levels, color levels, hue, black and white levels, black and white gradient colorization and more all with a click of a mouse. With ProPalette, users now have the ability to seclude colors with in their footage and fully customizing the hue, levels, and more. With ProPalette, users can change the mood of their project by bringing their audience’s attention to a subject matter, or simply make color alterations to their footage all with in a click of a mouse all with in Final Cut Pro X.
ProPalette offers a wide selection of color combinations for all sorts of situations. With ProPalette, users are given over 90 color palette combinations, each preset having it’s own color selection that is fully customizable. Users have the option of selecting a preset with one or more color seclusions by simply clicking on their color palette selection and dragging it on to their footage with in the timeline all with in Final Cut Pro X. With ProPalette, easy to use published parameters each user can create their own custom colorize look with just a few clicks of a mouse. Users have the ability to alter their color matte levels, color levels, hue skew adjustment, black and white effect opacity, black and white levels, gradient colorize controls, and more. Users can make their media pop in a whole new way all with in Final Cut Pro X.
ProPalette was professionally designed to work seamlessly inside of Final Cut Pro X. 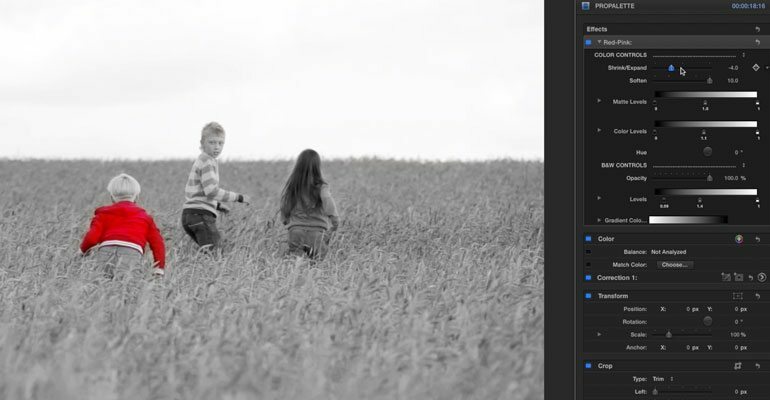 As a FCPX effect, each ProPalette preset can be dragged and dropped onto the users footage and have instant results. With the published parameters found in the FCPX inspector, users have the ability to make adjustments and generate their own color palette effect with just a few clicks of a mouse. Learn how to isolate a specific color in your scene with the ProPalette Lesson from Pixel Film Studios. Let's begin by selecting a video clip or image from the FCPX media library and dragging it to the timeline. Once, you have your video in place, go to the FCPX effects library to locate the PROPALETTE presets. Scan through the color styles and select the one that isolates the color or range you want. Then, drag the effect onto your clip in the Final Cut Pro X timeline. Now, let’s customize the look of our PROPALETTE effect. Select your video layer in the timeline and then go to the Inspector window. Use the Shrink and Expand slider to adjust the selection area for the effect. Then use the Soften slider to blend the edges of the selection. Adjust the Matte Levels to further calibrate the selection range of the black and white area. Once you have your color isolated, use the Color Levels slider to adjust the exposure of the area. 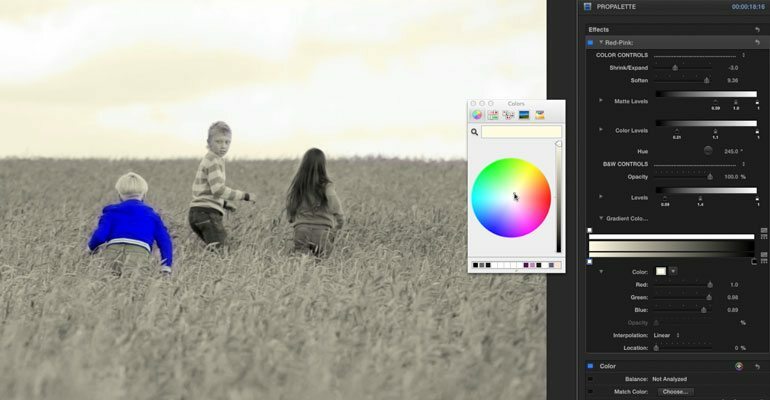 If you want, you can use the hue adjustor to change the color of the isolated area. Now for some Final Touches. If you want add some color back to the desaturated area, you can use the gradient bar to remap the darks and lights in your image. Where do I find ProPalette? 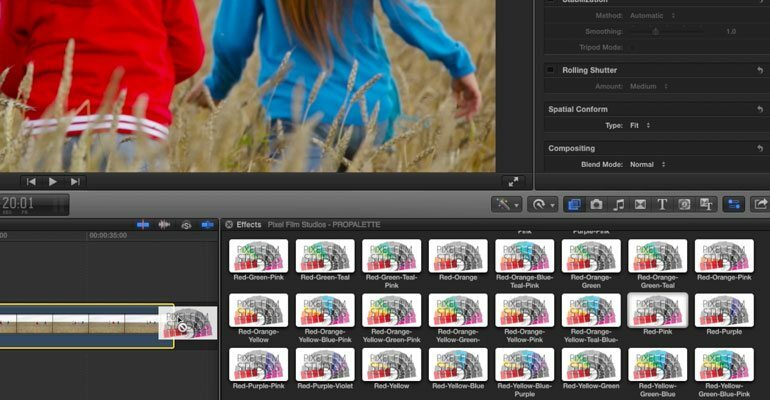 Once the installation is complete, you can find ProPalette in the FCPX effects library.